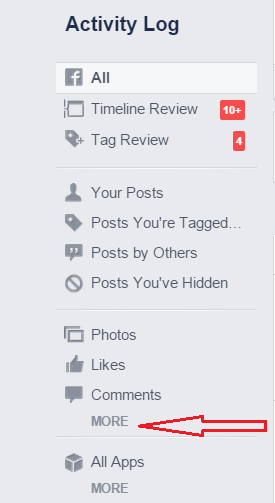 From the beginning of the your account you had made several search from your Facebook account, looking for friends, pages, ex partners and some other person. You know the social network stores every single term you enter in the search box. Although the privacy setting for this data is set to "only you," you may feel uncomfortable having that info hanging around. So you always want to delete every footsteps behind you. Here is the good news for you all that you can delete all the Search history from your account with the simple following steps. You have to just follow some simple steps. 1. First of you visit your profile page and click on "Activity Log" button at the bottom of your cover photo. 2. You Activity log is the list of all the activity you do on your account, like posting, liking, commenting etc. It also shows your search history. 3. Now on the left side of the same Activity log page, you will see "More" option right below the "Photos," "Likes" and "Comments." 4. On clicking on "More" the list gets expand and now look for "Search". 5. Now click on Search, there you will get all the search history of your self. To delete all the history, simply click on the "Clear Searches" on the right top of the page. For more convenient we have a Video tutorial of the post, so you can watch the video also for deletion of your Facebook Search History.